From the outset, I had two characters to choose from: Clive and, er, a woman whose name I didn’t catch. Clive himself walked at a faster pace but didn’t offer as much aerial control as the woman. Preferring speed, I stuck with Clive. 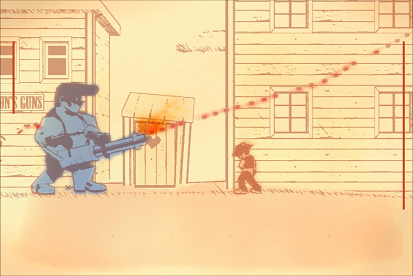 Gameplay started out easy, but Gunman Clive was quick to define its core. Clive and his lady friend can only shoot straight forward, but then again, the same is true of most of their enemies. Ducks will also damage you. How? I don’t know. Their opponents, baby blue renegade cowboys, would try to get the upper hand by hiding behind boxes or taking the high ground. At its core, Gunman Clive is a game about waiting and watching enemies, studying them for a chance to strike. In the case of guys hiding behind boxes, your only option is to leap over them between gunshots and take them out from behind. It’s a simple, old school notion of gameplay, and it’s one that’s still catchy. Having cut my teeth on this sort of thing many times before, though, I was mostly attracted by the graphics and music. I typically prefer sprites to 3D models, but I can’t deny that Gunman Clive’s dusty, sketchily-scrawled models look just plain cool. I’m pretty sure someone animated this game 150 years ago on a sheet of paper that’s now yellowed and raggedy. The music follows suit, containing the acoustic guitar strums, whistles and rhythm that are stereotypically wild west. I can only presume this is a fight over who gets to use that outhouse first. The first world concluded with, as you might expect, an encounter with a powerful boss enemy. It wasn’t until this boss that I really sat up and took note of what was happening. If you don’t watch out for his tells, he can easily ruin your day with long lines of gunfire. Like every other boss in the game, though, if you know where he’ll attack you and when, you can usually sit right next to him and pump countless rounds into his knees. Boss patterns are tightly scripted, so while they might be a little fast, it’s easy to predict what will happen next if you study them. If you know what you’re doing, it can be over quickly. And the second world kept my attention. Each level took advantage of a new idea, whether it was a type of platform or a new enemy. My favorite addition was a floating platform I could move by my weight. If I stood on the right side, it would drift to the right; if I stood on the left, it would drift to the left. I had fun piloting my own platforms like that, and the second world was full of elements I got to influence. There’s a fleeting sense of creativity in world 2. Ahhh, the wild west. This is certainly it. The third world lost me a little when it relied more on elements beyond my control. In response to the moving platforms I just described, world 3 had platforms that would swing of their own volition. Still, what world 3 lacks in fun, it makes up in challenge. Now that I couldn’t guide the platforms, jumps were hairier. It’s worth noting that enemies never grew much beyond world 1. Rather than develop trickier enemy tactics, Gunman Clive concentrates on its platforming to make enemy encounters more difficult. For instance, facing an enemy on a moving platform is harder than facing one on steady ground. The final world offered a mix of fun and challenge. There were quite a few strange elements that I didn’t expect based on the fact that I was playing an old timey cowboy game. Granted, if you’re familiar with 2D platforming (particularly—but not limited to—Mega Man), there won’t be anything new here. I usually struggle to rein in my reviews, since they can get way too long, but that’s the long and short of Gunman Clive. It borrows elements from a slew of older platformers, and while it might not be original, it is thoughtfully crafted. There are also a number of reasons to replay the game, such as its multiple characters and difficulty settings, to name a few. 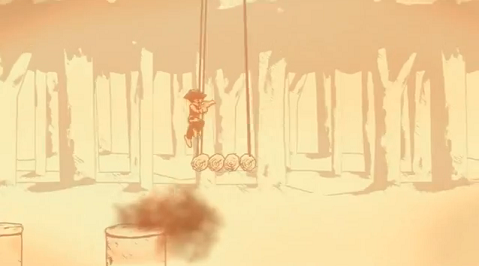 Overall, Gunman Clive provides a nice, short primer on platform shooters. 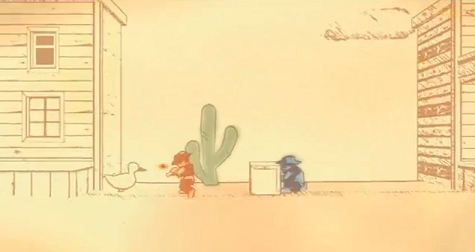 Gunman Clive is definitely a fun and quality product, but nothing about its gameplay stands out. I would only go out of my way to recommend it to folks that don’t have much experience with the genre. Value Verdict: Purchased new on my 3DS in 2013 for $1.99. Then again, for two dollars, I can’t say I regret the purchase. The game contains twenty stages (that’s counting boss stages), and while my first playthrough lasted just over half an hour, this will definitely be a fun game to pick up in the future as a time killer.